Running a tad late today as we had to get our kiddo to an early vocal performance, but here’s your card for Saturday! Hope everyone had a wonderful weekend. Oh, and what a meaningful card. Cranes hold a lot of symbolism, especially to those familiar with Celtic myths. The Crane is also able to join it colleagues to fly in formation or to dance together. You may need to learn the right balance between being alone and working with others. Spending too much time alone can create feelings of isolation and separation. Conversely, having no time to oneself can be an avoidance of self-knowledge and the uncomfortable feelings of loneliness. Spend a while looking at tour life to see whether you give yourself enough time having both of these experiences. The shadow side of the Crane is manifested as harshness, meanness and a nagging, complaining disposition. If you find these qualities showing sometimes in your behavior, see if you can experience the deeper aspects of the crane, in which it becomes an animal of the Goddess-as-crone or wise woman. Ask yourself to what extant you are denying the wise woman who has a knowledge of death and the Underworld in yourself, and to what extent your negative behavior may be a reflection of this denial. 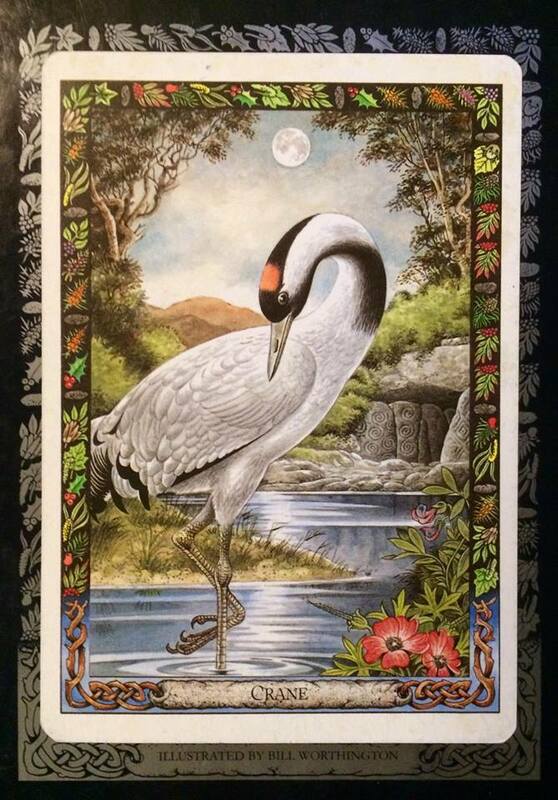 THE CARD: The card shows a crane fishing in a pool. Its legs are crossed to show the Ogham letter Muinn, and it gazes into the water, patiently waiting for sight of a fish. Behind the pool is a cave entrance to the Underworld, and in the evening sky the full moon is rising. In the foreground grow bitter vetch and bloody crane’s bill.